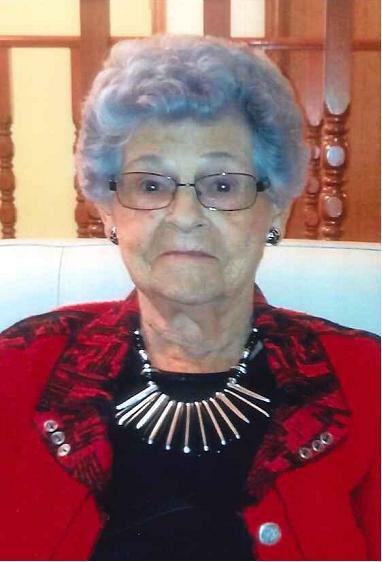 Delores Eleanor Larsen, late of Weyburn, SK passed away January 25, 2019 at the age of 95 years. Delores was predeceased by her parents: Oscar and Almyrah Roysum; first husband, Lawrence Skjerdal (1958); great-granddaughter Rachelle Hallberg; brother Omer Roysum; sisters: Fern Clausen, Pearl “Peggy” Johnson; sons-in-law: George Barsness and Roy Lohse. Delores is survived by her husband Duane Larsen; her children: Larry (Eleanor) Skjerdal, Beaubier, SK, Elwood (Betty) Skjerdal, Beaubier, SK, Karen Barsness, Weyburn, SK, and Myrna Lohse, Beaubier, SK; 11 grandchildren, 32 great-grandchildren and 8 great-great grandchildren; 2 sisters: Vivian Johnson, Beverly Locken; sister-in-law: Lorraine Roysum. A Funeral Service was held Friday, February 1, 2019 at 11:00 a.m. from Zion Lutheran Church, Weyburn, SK with Pastor Victoria Mwamasika officiating. Active Pallbearers were: Byron Skjerdal, James Skjerdal, Brent Skjerdal, Kevin Skjerdal, Barry Barsness, Jeff Barsness and Brandon Lohse. All in attendance were considered Honorary Pallbearers. Luncheon was held at Zion Lutheran Church, Weyburn, SK following the service. Interment was held at St. John's Cemetery, Beaubier, SK. For family and friends so wishing, charitable donations in memory of Delores may be made to a charity of the donor's choice.